11 New York construction workers died on the job over the last 12 months. 9 of them were non unionized and two of them were unionized. 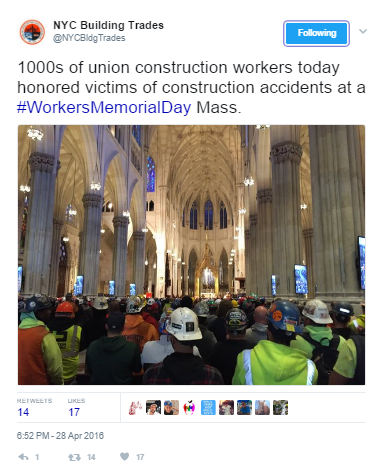 These fallen hard hats were honored yesterday in St. Patrick’s Cathedral by thousands of construction workers. The mass is an annual tradition in New York. Thousands of construction workers most of them coming straight from work in their dusty outfits filled the cathedral. 15 different trade unions were present. Rev Brian Jordan, chaplain for the Building and Construction Trade Council of Greater New York, presided at the the mass. Behind him were 11 empty chairs each with a white hard hat and a rose.